The European championships has, since inception, been the stage where some of the most unforgettable moments of sheer footballing pleasure, been served. 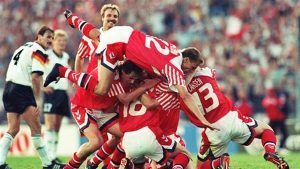 From the underdogs, to the Golden Goals, this is an attempt to highlight some of those memorable episodes in recent history– restricting my list to an arbitrarily chosen Euro 96, in no particular order. I remember this match, just like yesterday. I called it the year 2000 – the year of Totti, but he wasn’t nearly the protagonist in this match, it was Francesco Toldo! He is almost the sole reason why a scoreless draw made it on to the list, well, apart from the legendary unluckiness of the Dutch. The Czech got to the Final of this Tournament, but how many remembers the Catalyst for this run? It was this match, a group stage match, set at Anfield. The Czechs were 2-0 up at a point, and then got 3-2 down with just three minutes of stoppage time to go, mentally packing their bags to go home. Remember Vladimir Smicer? Yes, the same Smicer that scored the second goal of Liverpool’s legendary Champions League Final come back against AC Milan some years after; equalized at Anfield for the Czechs in this match to make it 3-3 and salvaged a point for the Czech Republic. This draw, plus Italy’s failure to beat Germany in the simultaneous group game put the Czechs through, sparking a run that only ended in a Golden Goal defeat against Germany in the final. This is another match featuring the Czechs, but this time, the comeback is not about them. The Turks were down 2-0 with 15 minutes to go, facing elimination from the group stage. Qualified they did, after they scored twice in the last 4 minutes to qualify on goal difference. Worthy of mention is the fact that if this match had finished as a draw- because Portugal had already qualified from the group, the qualifying team would have been determined by a penalty shoot-out – what would have been the first group stage penalty shootout in a major international tournament. The Czechs went into half time 1–0 up, and doubled their lead soon after half-time. Arda Turan brought the Turks back into the game in the 75th minute, before Peter Cech made an uncharacteristic error, dropping the ball at the feet Nihat Kahveci, who was left with a simple finish. Boosted by the equaliser, Turkey went for the win, and two minutes later, Nihat curled the ball past Čech from 20 yards. Then, with just moments left to play, the Turkish goalkeeper Volkan Demirel pushed over the big Czech striker Jan Kohler, resulting in a red card for the Turk. With no substitutions left, Turkey had to put Tuncay Sanli in goal, but still managed to secure their place in the quarter-finals. Tempers continued to boil over, as Milan Baros was booked, despite having been on the bench for the whole game. Although, this was the best of the lot, Turkey served up thrills upon thrills in the tournament. 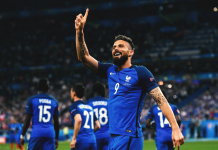 They beat Switzerland 2-1 with an injury time winner, and saw off Croatia on penalties in the quarter-finals after going behind in the 119th minute before losing to Germany in the semi-finals – to a last minute strike. This was THE match. Did I say this was the match? Spain came back from the dead to book their place in the quarter-finals in a seven-goal thriller. In this classic, Spain needing to win were behind 3-2 well inside added time. Then came the Mother of Come-backs, Spain somehow scored two goals within the remaining couple of minutes to qualify for the next round through Gazkia Mendietta’s penalty and Alfonzo Perez’s second goal of the match that sent the Spanish fans in the stadium into a wild euphoria. Yugoslavia on their end, led thrice in the match– the third lead coming after they were one man down, thought they had been eliminated. Until news filtered through in the Stadium of Norway’s goalless draw with Slovenia some 200km away and they joined the Spanish fans in the football frenzy. This was an underdog story, the first time, in a major international tournament, where both finalists were also involved in the opening game. Greece beat the host Portugal in the opening match 2-1, no one paid attention. Portugal was resurgent on home turf, beating their way into the final with the burgeoning Cristiano Ronaldo, Greece on the other hand, coached by Otto Rehagel, “one zeroed” their way into the final ala Leicester. The more one zero wins they churned out, the more people wanted to see their demise, to quote Barry Glendenning of The Guardian, they are “the only underdogs in history, that everybody wants to see get beaten”. There was no beating for the Greeks, after Angelos Charisteas rose highest by 57th minute from Angelos Basinas corner to head Greece in front, a lead they never relinquished to win the Euros against a monumental odd of 80-1. To drill it home, Greece beat the host team Portugal, twice – opening and closing matches, and won the Euros, in an underdog achievement matching the Porto’s Champions League win some months before, and arguably just eclipsed by the recent winning of the English Premiership by Leicester City. Everybody remembers this match, everybody remembers that Golden Goal from David Trezeguet, it was stuff of legends. Italy took the lead through Marco Delvecchio in the 55th minute and they held on to this lead in true Italian style until the final minute of Injury time, when Sylvain Wiltord squeezed a low drive under Francesco Toldo to equalize and took the match to extra-time. Treze-goal as I used to call him then, took off his shirt in a wild celebration – after winning the tournament from a strike from Robert Pires’ cut-back just before half-time of extra-time. Legendary stuff! This match featured Italy again, in yet another final. This match made it to my list because, somehow, the whole world thought this would be a close battle, defined by little details, a mismatch it was. No one could have predicted what happened, despite Spain being the current World and European Champion having won the 2010 World Cup and 2008 Euros respectively. This was due to the fact that Italy won against Spain in a friendly prior to the Tournament and were leading before Spain snatched a draw in their opening game in the group stage, also, Spain had a big scare against Portugal in the quarter finals, but what followed was the most one sided Euros final in history, a demolition. Spain ran riot, with the highlight being when Jordi Alba’s lung bursting run almost across the full length of the field was found by the midfield maestro Xavi Hernandez, and ended with a precise finish from Alba for the second of the four goals. 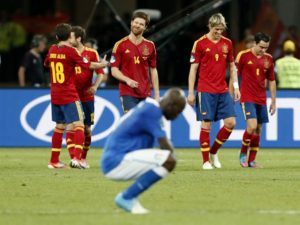 This match cemented Spain’s place in history, being the first Country to win 3 consecutive major international trophies– Euro 2008, World Cup 2010 and Euro 2012, but it also heralded their steep fall from grace that culminated in their disgraceful exit from the group stage of the 2014 World Cup. Fine, I said at the beginning that I am restricting myself to Euro 96, but I just had to ignore my self-imposed restrictions for this particular underdog’s story. Yes, we all know this story, we all know this history. A team that didn’t qualify for the tournament, which was called up at the last minute to replace war-torn Yugoslavia, scraped through the group stage where they didn’t score in their first two matches, missing their star player – Michel Laudrup, won the Euros with this match being the culmination of that Cinderella story. The enthusiasm in the commentator’s voice sums it up. This truly is an inappropriate mention; it was actually a FIFA 2006 World Cup match, between two European teams, Portugal and Holland, on European soil Germany. You would agree that it could as well just be a Euros match. 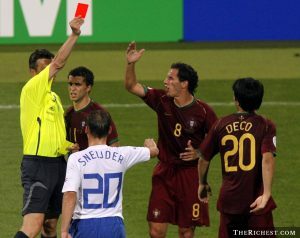 This match also termed The Massacre of Nuremberg, finished 1-0 in favour of Portugal, was played with a lot of bad blood, someone described it as “a crazy match, where everyone was trying to get sent off”. See the best actions from the game here.